Roy Newsome Enterprises, Inc. Mr. Newsome owns several large websites including Sweetheartsunlimited.com. This dating portal is one of the oldest on the Internet, online from the past 7 years the number of users exceed 100,000. The Sweetheartsunlimited.com portal was in a need for a complete revamp as the system was unable to scale to the number of users who hit the website daily. There were also gaps in the functionality that irked users who compared a 4 year old website with the likes of Face Book. The old system followed a peculiar database structure and was written using legacy technologies. Porting the data without any substantial disruption to the service was imperative. 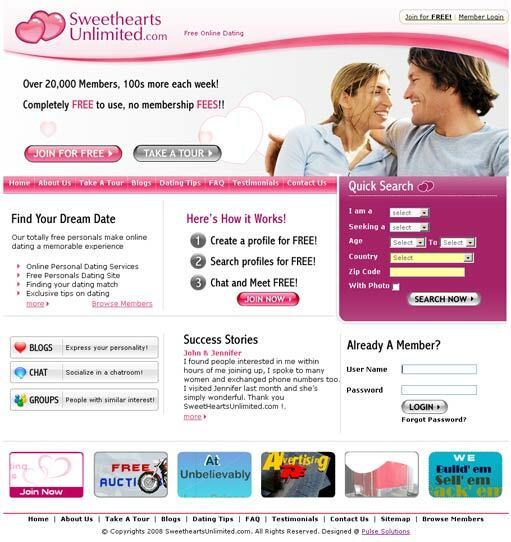 The end result needed to bring the lost glory back to the website, all of the latest functions, bells and whistles needed to be in place if Sweetheartsunlimited.com was to reclaim its position amongst new generation Dating websites. Pulse visualizers started from ground up on the design, a new logo, new color scheme and a hot new layout targeted towards the new generation and optimized for a larger resolution and better graphics capable computers. The system design was built on Web 2.0 principles for better usability and included all features that make up a modern Web 2.0 social networking portal. The software was built from ground up as well to accommodate the huge number of users, mails, hits and matches the site was expected to receive multiplied by 100 to ensure the new system stands the test of time. The system was made to be hacker proof as social networking websites are a major lure for hackers. The code was secured in terms of malformed requests, hidden redirects, sql injection and several old and new hacking techniques. The database was secured with encryption technology and the server was configured to be behind 2 layers of redundant firewalls. The software was built using PHP5 and MySQL5 to leverage open source technology and save on expensive licensing costs. The complete system was built within 3 months, features include an intelligent people matching engine, chat rooms, blogs, advanced profile customization and user groups on the lines of Face Book. Sweetheartsunlimited.com has not only regained lost market share, the growth rate of the website has drastically improved. The website is adding hundreds of users each week and users find the system intuitive and easy. Thousands have found the love of their lives on the website and thousands more have created lasting relationships. The website has several won awards on design and usability but the most important achievement has been that the downturn has been turned around and the website has a very bright future ahead.